A NIWA spokesman was quick to point out that they bought the Cray in 1999, so would have been hard-pressed to use to it predict an El NiÃ±o in the preceding year, but Leyland’s outburst is mainly interesting for two reasons: it’s an amusing public parade of ignorance (a bit like standing in the middle of Wellington wearing a dunce’s hat shouting “Look at me!”), and because he recommends that NIWA give up climate modelling and instead rely on the work of a British forecaster called Piers Corbyn. 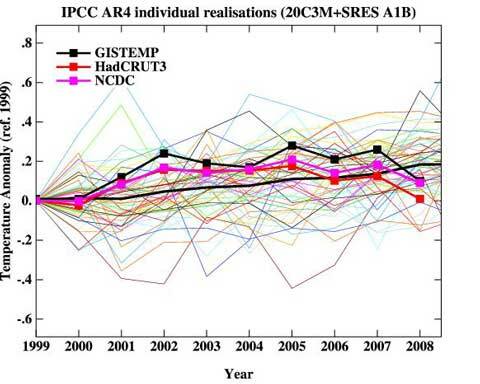 Let’s start with Leyland’s take on climate models. What this tells us is that there is something fundamentally wrong with the climate models that they are using in their existing computer. The $12.7 million new computer will simply give them more wrong answers even faster than before. It will do nothing to solve the fundamental problem – that, all over the world, climate models have dismally failed to predict the climate. NIWA should also take notice of the better than 80% accuracy of weather predictions produced by Piers Corbyn at Weather Action in the United Kingdom. For several years, he has successfully predicted severe weather events in United Kingdom months in advance and recently he has expanded this to hurricane prediction in the Caribbean Sea, the Pacific and Indian Oceans. Before NIWA get any money for yet another supercomputer they should be forced to explain exactly why a small organisation with desktop PCs has consistently outperformed all the supercomputers running climate models all over the world. To many climate scientists, the answer is obvious. Piers Corbyn bases his predictions on solar effects, not man-made greenhouse gases. It is high time that NIWA gave up its greenhouse gas induced delusions and followed suit.